Imagine the rotary telephone making a comeback. That unlikely event is roughly analogous to what’s happened with the vintage turntable. 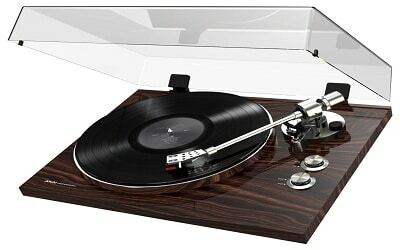 Left for dead by the side of the cultural road back in the late 80s the turntable has found new life here in the early 21st century as audiophiles have rediscovered the tactile joys of handling vinyl platters along with their generally outstanding sound quality. With vinyl being the only truly lossless audio playback format a high-quality vintage-style turntable can provide a foolproof way of hearing music the way it was intended. 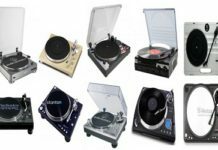 Below is a selection of the best vintage turntable offerings on the market today. With vinyl sales surging more than 30 percent last year it should surprise no one that companies that make audio equipment are producing vintage turntables to meet demand. One such company is Akai Professional out of Singapore. Their new BT500 has all the design cues that make vintage turntable fans swoon plus a couple of postmodern enhancements that don’t leave the digital audiophile out in the cold. This is an extremely handsome piece of retro-style audio kit with a rich walnut finish and low, low profile. The die-cast aluminum platter is genuinely hefty and provides excellent stability so your vinyl isn’t all over the place. The brushed aluminum controls are easy on the eye and the belt drive action is smooth and ultra-consistent. Leveling bubble ensures the adjustable legs can do their job properly. Automatic conversion of your vinyl products into digital files that you can shift to your computer via the USB port. The “BT” in the BT500 stands for Bluetooth, a feature you’re obviously not going to find on a true vintage turntable. Here it’s a nice touch for those who can’t stand to lose touch with the digital/wireless age even for the 20-odd minutes it takes for the pre-mounted Audio-Technica cartridge with its elliptical stylus to make its way across your vinyl platter. The Tokyo Electro Acoustic Company or TEAC has been around more than 60 years. Long enough to see the rise and fall and rise of vinyl. While they’re owned these days by Gibson they retain their founders’ interest in producing high-quality consumer-grade audio products and the TN-300 fits the company profile perfectly. The TN-300 is a belt drive disc player with a DC motor that will play your 33s or 45s as well or better than virtually anything you might have been able to buy back in the day. Rotation speed is generally accurate and stable and the elliptical stylus produces 2g of pressure. Overall audio quality is excellent with minimal distortion and a clean, clear signal to noise ratio of about 67 dB. The RCA jacks are gold plated for corrosion resistant and allow the TN-300 to be easily switchable between line and phono. Premium Audio-Technica VM cartridge provides accurate reading out of the box. Phono and line inputs let you play your vinyl platters with or without an equalizer. Die-cast aluminum platter provides a rock solid foundation for your vinyl. Ability to convert your analog music to digital automatically and upload via built-in USB port. 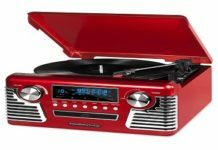 Being able to convert your vinyl collection automatically to digital while listening is a feature many of the best retro-style turntables being produced today share. It’s an important feature in that it ensures you’ll always have high-quality copies of your precious old vinyl platters. Rega is another audio manufacturer that’s been around a while. In their case since 1973 and the heyday of vinyl. They bring their lengthy experience to every turntable they manufacture including the sleek, dependable RP1. The RP1 is deliberately simple, devoid of most of the nods other retro-style turntables make to digital music fans. 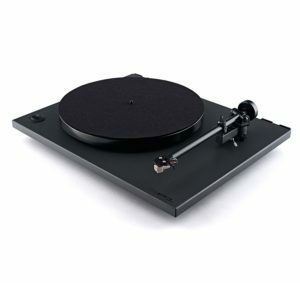 If you want those you’ll need to check out Rega’s higher-end models. Because the RP1 is 70s chic the way they actually did it in the 70s. The unadorned base of the RP1 is modernist reduction at its best. The rubber feet keep the plinth where you place it. Just be sure to place it on a nice level platform since there is no leveling bubble to guide you. The belt drive features a stepped pulley that allows for manual speed changing that reduces wear and tear. The RB101 arm is the little brother of the company’s widely praised RB300 and the family DNA is obvious in its easy, precision handling. The Ortofon OMB5 cartridge is pre-fitted and provides high-quality audio with a low SNR. The RP1 is as handsome a retro-style turntable as you’ll find. Setup takes only a few minutes as the RP1 is virtually ready to go out of the box. 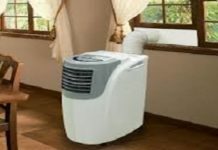 Also one of the most stable with its low vibration motor. 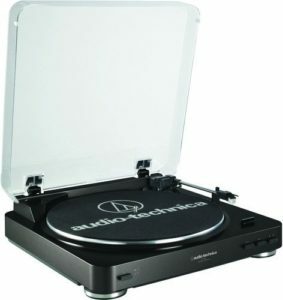 The AT-LP60 BK from Audio Technica is a good entry level old school turntable with a reliable belt drive, the ability to select between the built-in pre-amp or an external one, quartz timing control and the option to play either 33s or some of your old Donny Osmond 45s. Professional DJs aren’t going to be lining up to purchase this but unless you need to perform some heavy duty back cueing, you might want to. Die-cast aluminum platter provides a stable platform for your vinyl. The diamond stylus on the company’s Integral Dual Magnet cartridge is easily replaceable. Belt drive is fully automatic and plays either 33 ⅓ or 45 rpm offerings. Tonearm can be set automatically or manually. Retractable dust cover keeps everything nice and clean the way it should be. If you’re new to vintage-style turntables this is an affordable, dependable entry point. The final entry on our best vintage turntable list is this fully automatic offering from Denon. 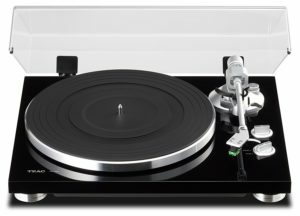 The DP-300F Analog is a turntable that will have mom and pop getting all misty about the old days while the kids use it to crank up the retro at the rave. The base here is nice and heavy which makes for a stable platform on which to play your vinyl. The turntable sheet is equipped with some serious 21st-century tech with its hologram vibration analysis capabilities that make jumps and bumps a thing of the past. While the auto start/stop feature makes sure the stylus is always properly set. The 300F offers both 33 ⅓ and 45 rpm options, the DC servo motor works hand in hand with the belt drive to provide consistent play with virtually no noise. And should you need to replace the cartridge on the 300F the headshell is easily removable making the whole process a snap. Dust cover and genuine rubber anti-slip mat. Phono equalizer built in. Allows the player to be connected to an integrated amp. Cabinet wall is thicker than most at 4mm providing heft and stability. 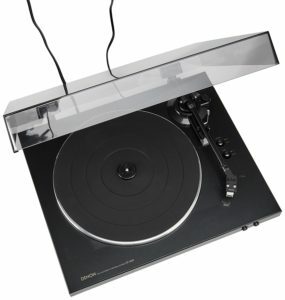 Turntable is made from high-quality die-cast aluminum. Some people are reluctant to play their vinyl on anything short of the highest end equipment. With the 300F though you’ll have nothing to worry about. The auto cueing feature protects your platters from unsteady hands, the extra weight added to the base helps eliminate bumps and the standard MM cartridge is compatible with most 5.0 to 10.0 g cartridges. 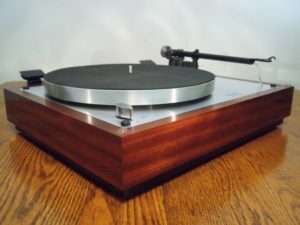 Should I Buy a Belt or Direct Drive Turntable? Which is Best: Automatic, Semi-Automatic or Manual? Every turntable in existence falls into one of these categories. The trick is finding the one that’s right for you because really, the one you select will be largely a matter of personal preference. There are purists who insist on cueing the records themselves, while for others who may be visually impaired or have a less than steady hand automatic cueing is a necessary convenience. 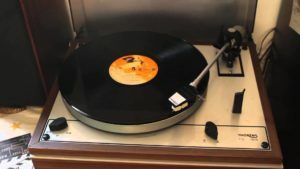 While the majority of vintage-style turntables produced today are manual, semi-automatics are slowly making inroads as people embrace the idea of not having to get up to return the arm when the record is finished. For those thinking that manual turntables are mechanical free-for-alls that require nerves of steel remember that most have a cue lever that provides smooth, dependable action. How to Choose a Phono Cartridge? You will need to know how the cartridge is attached – A standard mount is most common as the name implies and uses 2 screws to secure itself to the headshell, while a P-mount uses prongs at its back end to plug into the tone arm directly. P-mounts are most typically found on Technics brand turntables. You will need to select a stylus shape – Most professional DJs will choose a stylus with a spherical shape because it produces less wear and tear on the vinyl. Most home systems though will use an elliptical stylus which picks up more information for superior sound quality. Finally you will need to consider your budget – If you’re rolling in dough you can find cartridges that cost upwards of $15,000. Most of us however, are not rolling in dough and so for us it’s a matter of which $60 to $100 cartridge is the better value. Simply because it doesn’t make sense to put a $500 cartridge on a $100 turntable. Given that the cartridge is the heart and soul of the turntable you’re going to want to make sure you practice proper maintenance. The only rule that really matters when it comes to proper cartridge maintenance is to keep your vinyl discs and your stylus clean at all times. 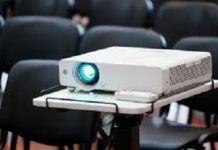 A quick search of the Internet will reveal dozens of products that will help you do so along with even more videos demonstrating the best ways to clean your records. No matter which cleaning technique you employ though you should make sure you clean both stylus and record before every play. Lead by the resurgence in vinyl the vintage turntable has found new life and purpose here in the digital age and is now celebrated and sought after for its ability to produce dependably high-quality audio experiences. Whether you are new to the world of recorded music on vinyl or are an audiophile of long standing you’ll find something to like in the 5 vintage-style turntables reviewed above.